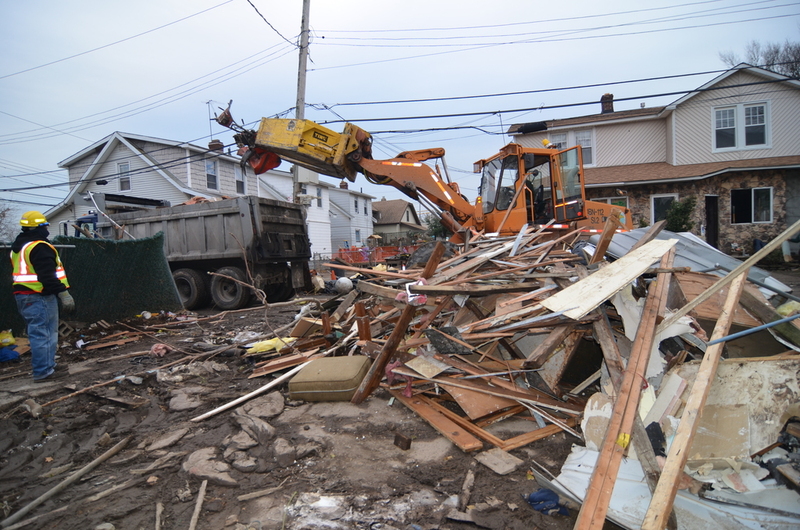 Just over half of the deaths caused by Superstorm Sandy, 22 to be exact, occurred on Staten Island's East and South shores, as the storm's waves battered homes and swept some off their foundations. Now the island is in a race against time to prepare for the next major coastal storm. Multi-million dollar resiliency projects are coming to Staten Island, from a sea wall on its East Shore to the expansion of innovative "natural drainage corridors." The island's East Shore is directly exposed to the New York Bight, a coastline formation that can channel powerful storm waves and surges into areas within New York Harbor. The U.S. Army Corps of Engineers is planning to construct a "mega" sea wall that will protect over half of the East Shore, from the Verrazano Bridge to Oakwood, said Staten Island Borough President James Oddo in a phone interview. "This is a different timetable than [the initial plans] we talked about," added the borough president. "Help has been all too slow in coming...There will be several hurricane seasons." Oddo said that smaller-scale protective measures were underway, such as the elevation of several hundred homes using new FEMA flood maps as a guide. The city has also rebuilt 26,000 linear feet of dunes between South Beach and Conference House Park. But "[the dunes] were not designed to handle an historic storm," said Oddo. "They were designed to handle beach erosion." What happens if you're not behind the mega wall? One area on the eastern shore that won't benefit from the Army Corps mega-wall plan is the district of New York City Council Member Vincent Ignizio. There, a package of other solutions has been developed in conjunction with the city, the state's New York Rising program, and the federal government. They include construction of a series of "living breakwaters" and protective berms, home elevations, and, in some cases, strategic retreat. Ignizio expects these initiatives to be effective, and the lack of a wall not necessarily a problem. "People want to be protected but not walled off," he explained. But what is missing, Ignizio added, is a more robust home elevation program. The city's Sandy rebuilding program, Build It Back, will only pay for an elevation if half or more of the home was damaged, he said. Since the goal is to elevate, the city and homeowners could share the cost in cases where less than half of the home was damaged, Ignizio argued. The city is reviewing his proposal, the council member said. The Mayor's Office did not respond to questions about the idea. Ignizio said that the de Blasio administration is moving at a faster pace than that of its predecessor, but he added that no matter what, "The sad reality is that these projects will be extremely helpful but will take a long time." Concluded Ignizio: "I'm getting tired of the studies and the reviews. ...I want to see shovels in the ground and hammers in the streets." Staten Island's vulnerability to flooding is tied to both a changing environment and lack of planning by the city over several decades. Oddo said some neighborhoods along the East Shore still have no storm drains because of their haphazard conversion from summer bungalow to year-round communities. "This community still remains vulnerable to moderate rain," he said. "We are paying the price in 2013, 2015 for what we did in the 1950s and 1960s." The city has started to construct storm sewers and drains where possible. Some areas – like Midland Beach - are below sea level, a further complication. The city has also been acquiring land for a "comprehensive Mid-Island Bluebelt," which would drain a 5,000-acre area, encompassing the South Beach, New Creek (Midland Beach), and Oakwood Beach watersheds. "It's a decades-long, 30-year plan," said Oddo. "We're still a ways away." The hope is that the Mid-Island Bluebelt will mirror the success of the Staten Island Bluebelt, which makes use of natural drainage corridors — such as streams, ponds, and other wetland areas — to convey, store, and filter stormwater. Concrete pipes along the corridors move stormwater from conventional storm sewers into the Raritan Bay or the Arthur Kill. The city describes the Staten Island Bluebelt as "one of the most ambitious stormwater management efforts in the northeastern United States." The ultimate objective, said Oddo, is to "help people re-start their lives." And for many Staten Islanders on the East and South shores, this means moving back from the sea. Oddo said that he and Council Member Ignizio brought the concept of acquisition for re-development to the Bloomberg administration in March, 2013 - about five months after Sandy. The idea was to allow residents to sell their homes to the government in order to be able to rebuild more safely somewhere else within the area. The state and city have launched an acquisition program in three neighborhoods: Ocean Breeze, Oakwood Beach and Graham Beach. Representatives from neither the city nor the state responded to questions about the status of the program. "Bloomberg should have embraced acquisition for redevelopment," argued Oddo. "If you can acquire a block, then you can raze structures, and raise property — that never happened. Two years, four months later — what are the holdups?" Failure to embrace the concept of acquisition for redevelopment is self-defeating, maintained Ignizio, since using the approach would limit exposure of homes to storm surge and lessen the need for resiliency projects. "It's hard not to be frustrated and angry," said Oddo. "No mayor of New York City has stood up and told the people of Staten Island, 'We fully believe in acquisition for redevelopment and are committed to it.'" The city could show the type of truly resilient housing that may be constructed, said Oddo. And concerns about government [effectiveness] could be overcome. "People can buy into their neighborhood again." Added Oddo: "I believe in this program. It truly would have worked on a wide scale if we had gotten support from the Bloomberg administration. [It would be] a really powerful message if Bill de Blasio stands up [and] says 'we're ready to go.' You'll see lots of Staten Islanders come forward."